Government Securities | 8x8, Inc. When government agencies decide to use any cloud solution, they expect three things: confidentiality, authenticity, and integrity. They want to be sure that their connection is encrypted to the point that the URLs, cookies, and other sensitive metadata are obscured. Also, they want to be sure that they are talking to the “genuine” websites, and not to impersonators. Last but not least, the agencies need to be confident that the data sent to and from the websites they visit has not been interfered with or altered. For the above expectations to be made there are stringent government securities that every cloud solutions provider need to comply with. As such, apart from controlling or reducing spending, the US federal government agencies are preoccupied with the responsibility of ensuring that they are operating on secure, compliant and collaborative unified communications. Government securities are encryption and authentication standards established to protect the confidentiality of government web transactions. Government securities protect data from interception or modification, which is likely to subject government consumers to eavesdropping, stalking, and the alteration of received data. Some of the US government security protocols include FISMA and HIPAA. HIPAA, short form for Health Insurance Portability and Accountability Act of 1996, is US legislation that stipulates data privacy and security provisions for safeguarding medical information. On the other hand, FISMA which stands for the Federal Information Security Management Act is US legislation that outlines a detailed framework to safeguard government information, operations, and assets against threats. How Does This Apply to Technology/ Software? The role of the government agencies is to provide better, timely and more economical services to their consumers and partners. But with the need to manage government securities, sometimes government agencies are forced to compromise the quality of their services. Also, the tax income that should go to primary functions such as healthcare and education is spent to maintain these expensive government securities. The good news is that there are cloud-based services providers, such as 8x8, that provide compliant cloud services that meet rigorous standards such as FISMA and HIPAA. 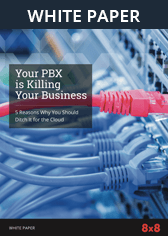 A reputable cloud provider should be able to provide immediacy to communications. Cloud providers like 8x8 have invested in world-class data centers strategically situated across the world. This ensures that calls are geo-routed to the nearest accessible data center resulting in strong connections and high-class call quality with minimal latency. Because the solutions are hosted on the cloud, Cloud Communications solutions eliminate the need for the agencies to have large amounts of capital to invest in equipment, service, and labor costs. This allows the government agencies to save considerably without affecting their core operations. Cloud communication systems like 8x8’s cloud-based SaaS communications solutions are 100 percent reliable. This is because they are delivered from echoed, high-class, 100 percent redundant, and top-notch Equinix data centers on the west and east coasts of the United States. Each data center is interlinked with private connections and connected to the Internet via several redundant links from Tier 1 and main Internet service providers, each with the ability to handle traffic for the entire data center. The cloud service provider should be fully compliant with the U.S. Federal Communication Commission’s Customer Proprietary Network Information (CPNI) regulations for safeguarding customers’ proprietary network information. Apart from the comprehensive and rigorous US government securities such as FISMA and HIPAA, respected providers such as 8x8 provide secure solutions for private Multiprotocol Label Switching (MPLS) connection services which are fully independent of the Public Internet. They have also met the US Safe Harbor data privacy standards for all EU/EEA member states. Last but not least, at the minimum the cloud services provider should be a publicly-traded company that is subject to compliance with the Sarbanes-Oxley Act of 2002. This will ensure that their information technology infrastructure controls are audited on annual basis by independent internal and external auditors.